In the last few days I have completed a half-hour-long 2-piano work called STORIES FROM THE 7TH WARD, a tribute to New Orleans. My friend Althea Waites, a member of the Orpheus Duo for which the set is written, and a native of New Orleans who grew up in the 7th Ward, was the catalyst for this suite. Hearing stories told to her by her grandmother, hearing about her mother and about her sister’s dream vision of her, and hearing Althea’s playing of pieces like Margaret Bonds’ “Troubled Water,” were the main sources of inspiration. Along with these, I was influenced by the music of my late distant relative, Tony Almerico, who was a prominent New Orleans Dixieland trumpeter, bandleader, broadcaster and educator, known for his Parisian Room All-Stars and collaborations with Pete Fountain. “Clambake on Bourbon Street” was probably his most successful recording. Here are the titles of the four movements of the suite with brief summaries of the stories associated with them. This piece is a scherzo similar to those of Chopin. Althea’s grandmother told of a crab who, along with many other crabs, got dredged up onto a boat deck and put into a barrel destined for a New Orleans restaurant. Unlike the other crabs, he was determined to get out and back to sea. He would struggle upward in the barrel, but for some reason the other crabs would pull him back down. Each time he got a little further toward the top, but it took five attempts before he successfully freed himself and returned to his aquatic environment. The outer sections of the piece depict the crabs being harvested from the water, scraping and clacking around on deck and in the barrel, and the valiant crab making his repeated escape attempts. The “trio” section contrasts this with “underwater music” that suggests a graceful “crab ballet.” In addition to these elements, I also included a “cantus firmus” passage in the trio section, expressly for Althea’s Duo partner Mark Uranker, who happens to come from my hometown of Cuyahoga Falls, Ohio, and [therefore?] is a devotee [like me] of the intensely contrapuntal composer/pianist Ferruccio Busoni. In 2008 my piece “Crying for Justice” was performed several times by the Pacific Symphony. The score calls for various Native American percussion instruments, including corn husk rattles (which I fabricated myself). Althea was present for one of the concerts, and afterward said that the sound of the rattles scared the living daylights out of her. She explained that the menacing tremolo was identical to the flailing of taffeta skirts worn by an apparition that she had witnessed as a child. The ghost appeared when Althea went alone into the kitchen. As she recounts, “When I saw the spirit, I screamed and ran to the living room, and after asking my grandmother why the spirit’s skirts were swishing back and forth, she said that this was one of our departed [Creole] relatives who was struggling to resolve conflicts that she experienced when she was alive. I spent the rest of the day being frightened, and my mom gave me hot tea when it was bedtime to calm me down.” The piece is really a scena that begins with brooding, disgruntled, dolorous material. A playful motif then enters, reminiscent of a tune Althea and her sister sang as girls. The encounter with the phantom is represented in a dynamic and disturbing episode, after which a calming lullaby theme takes hold. The corn husk rattles are employed by one of the players throughout, with a final receding shake at the end. 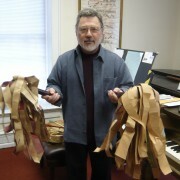 Here I am with a pair of my corn husk rattles. Althea tells of a dream that her sister Clara had after their mother passed away. In the vision, Mama came to Clara to let the two know that she was OK and not to worry about her, that she was up there in heaven telling God how to run things more responsibly on earth. The piece winds up being a sort of rondo, with the thematic areas arranged in an ABACBDA sequence. A favorite song of Althea’s mom (along with “Roses of Picardy” as sung by Mario Lanza) was “When the Saints Go Marching In” (as done by Louis Armstrong). This provides the basic material for No. IV, although neither tune is ever stated outright. The A sections march along brightly in C Major, then modulate and dance jovially. In the B section, Althea’s mom goes up and tells God about all the troubles on planet earth, that he mustn’t be an absentee father and needs to look down and straighten things out. He then answers, and genuflects, blessing all the races, showering them with gifts of harmony. The brusque C area chips at motivic material. D, to balance out the “saintly” music, presents a “voodoo” theme with incisive accents over an ostinato. All is in a spirit of celebration. Another piece that Mama enjoyed was “Für Elise,” which she would hear her daughter Althea practice at home. A figuration from the beloved Beethoven example is used transitionally to set off the second occurrence of A, and in the coda. And somewhere along the way, the listener may wonder if, in addition to God, Mama Clara once within the pearly gates ran into Thelonious Monk (though they perhaps be One and the Same!). Please accept my heartfelt thanks and gratitude for honoring and paying tribute to my mother Clara, grandmother Mary and my Creole and Choctaw ancestors for this glorious and most brilliant work. Thank you for creating this beautiful piece for us ! !